I guess now is time to get closer to the Government loans as this type of funding is neglected unfairly very often. Our experience shows that many business people usually know something about grants, but government loans are terra incognita for most of them. 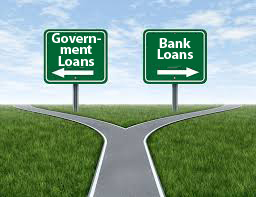 That’s why we offer you learn more about the Difference Between Government Loans And Bank Interest Loans. Usually, when looking for financing, business owners first of all visit traditional financial institutions. But are they right places to start shopping around for a loan? Let’s compare the terms that financial institutions offer vs. government’s ones with their interest-free loans. As you can see, there are way more advantages of government interest-free loans though they are not always known. Government loans are good to finance purchase or upgrade of equipment, business expansion, research and development, land purchase, etc. Don’t miss government loans! Call me at 647-535-2970 to discuss what Government loans you can apply for right now. P.S. Just few numbers for warming up: Investing in Business Innovation offers you up to $1,000,000; Advanced Manufacturing Fund – $10,000,000 – $20,000,000; Investing in Business Growth and Productivity – up to $20,000,000. That’s not bad at all! What do you think?